Our complete guide to one of the rarest weapons that ever existed in Fortnite: Battle Royale. On this page we've outlined everything we know about the Zapatron in Fortnite: Battle Royale, with gameplay footage of the gun in action. Fortnite: Battle Royale has a pretty generous selection of weapons, from shotguns to sniper rifles, but there's one item from the game's history that was deemed just a little bit too generous to stick around for long: the Zapatron. This fearsome weapon was capable of melting enemies from an absurd distance, and it's frankly a surprise it made it out of the Battle Royale beta. Make it out it did though, if only for a day or so before being rapidly patched out, never to be seen from a Supply Drop again. Editor's NOTE: In the section just below we've taken a look at a recent datamine and the possibility of a new look Zapatron being reintroduced to the game! Stay tuned to further updates very soon. There may have been a hint that the Zapatron's returning, albeit in a brand new form. 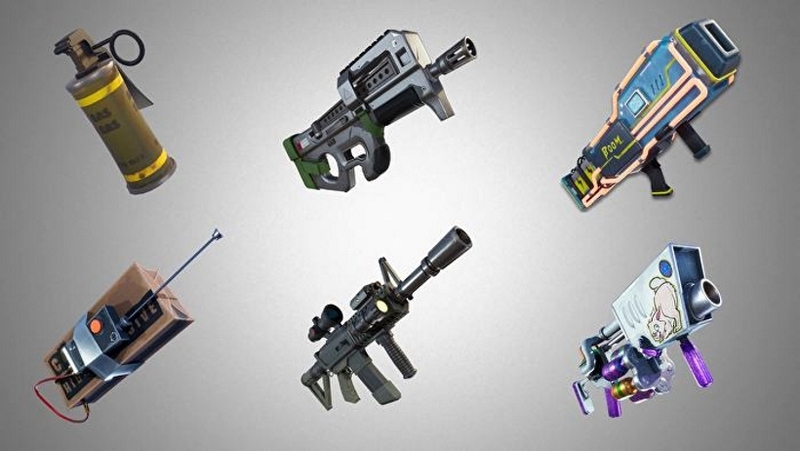 A datamine by Redditor Mlinki3636 has revealed six new weapons coming to the game in the near future, and confirmation of the Remote Explosive means that this info is legitimate. The weapon we're focusing our attention on is the Launcher at the top right. While it doesn't look like the original Zapatron, it's certainly putting an electrified twist on the traditional Rocket Launcher. Perhaps this is Epic's way of reintroducing the original weapon's character back into the game? We imagine it could work similarly to the original Zapatron but without the devastating one-hit-KO that was practically impossible to dodge. Instead it may fire off a slower moving projectile with the same potency, giving it a bit more counterplay! What is the Zapatron in Fortnite: Battle Royale? 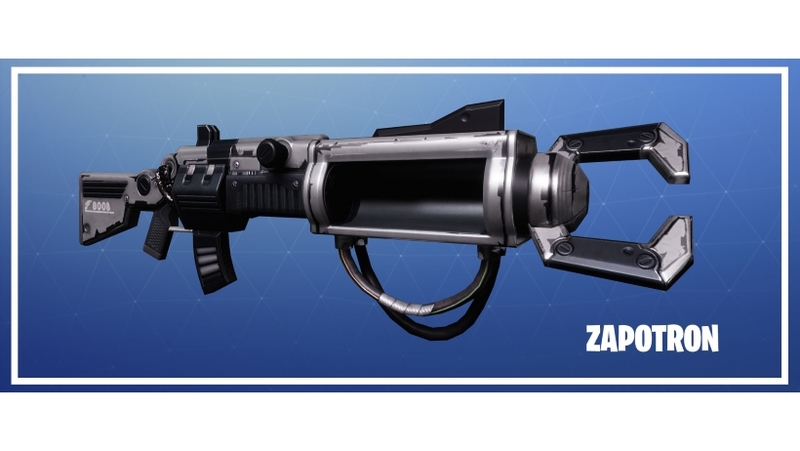 Fortnite's Zapatron is an incredible powerful sniper rifle which used to be available from Supply Drops in the Battle Royale mode. You couldn't loot it from regular chests on the ground, just from these special supplies. This incredibly dangerous electrical weapon was, in its time, capable of one-shotting enemies from an absurd distance, and before the other player could do pretty much anything at all to react to the threat at hand. The Zapatron can be used to fire electric bursts, or charged up to release an enormous amount of damage! Fire sparingly, as Cell Ammo is extremely limited. This weapon is only available in Supply Drops. Why was the Zapatron removed from Battle Royale? So over-powered and ill-fitting was the Zapatron considered to be, it was removed from Battle Royale within a day of the mode's release. Somehow, its absurd strength had been missed - or just ignored - during the private beta which took place ahead of launch. Will the Zapatron ever return to Fortnite: Battle Royale? Going by the tweet we've outlined above, it seems possible that the developers will return the Zapatron to the game's Battle Royale mode at some point in the future. Given that the team is clearly unhappy about the weapon's suitability in this area of Fortnite though, you should probably expect a significant reworking of the Zapatron before it's returned. Lower range and lower damage output seem likely options to us. Look at this footage, for example, and you'll soon understand why it's such a poor fit for the mode! That's all we know about Fornite: Battle Royale's Zapatron gun, and why it was removed from the game. If we learn any more about it - or we get more information about its return - we'll update this article straight away.